Are you on the same planet as the rest of us? I begin to wonder. When someone makes a comment on this thread, i tend to give my perspective of it. Or should we just ignore it. When people bring Hitler, Stalin, Mao, Clinton and go knows who else into this thread, you have a problem with me adding Pinochet and Marcos to that list. I wonder why that is? They where right wing brutal dictators maybe? Your insanity is my argument. God be praised, for when he created the world, he decreed that all the good, virtuous and righteous people shall hold the belief of the American conservative. Virtuous and righteous people are simply freedom loving people the world over. Limited Govt is essential to that. Those not for that are the communist/fascist authoritarians of the world - the evil people... the Mao's, Hitler's , Obama's, Stalin's, Clinton's of this world and those that support them. That is such a load of crap. There are virtuous people on BOTH sides, and there authoritarian people on BOTH sides. Clinton/Obama were barely even left, in fact they leaned right fiscally, nowhere remotely close to Stalin or Mao with how left they were OR how authoritarian they were. The problem is AUTHORITARIANISM, not left or right. People still don't grasp that here because people are blaming ALL problems on the left, which is silly. The OP is cherry picking little pieces of this guy's manifesto and equivocating it to communism in order to claim the guy was left wing and it is completely dishonest. Tell me, how many liberals are nationalists and gun rights extremists? How many neo nazis are liberal or pro communism? Yeah, didn't think so. I posted this before, it was ignored. 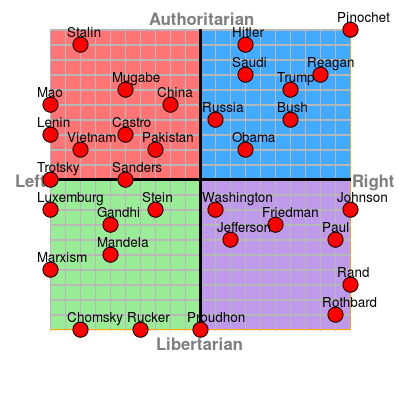 LMAO at saying Obama was authoritarian. He's not even close to any of the left wing authoritarians in policy. People are being completely delusional here. Listing him on par with dictators like Stalin, Mao and Hitler is some of the most laughable nonsense I have read yet. If Obama is that bad, then wow, Gandhi must be the spawn of Satan LOL! Yep. I'm done here too. This guy is straight up deluded. He literally said a few pages back that consensus doesn't mean anything. Consensus on a political theory is a consensus so that others can be on the same page when they talk of a concept, or teach it. We're not talking about physics or maths here, we're talking about an abstract human constructed label for a concept. It is what everyone agrees it is. This guy disagrees lol. Agreed, that person is pretty insane. They make a new thread every week pretending that liberals are communists and all the left is radical far left that want to turn us into Venezuela or Soviet Russia. It's simply not true. "Shall guarantee to each state in the Union a REPUBLICAN form of government"
It is a clear and present danger our military and security services must squash. To tell you the truth I would rather not even post anything this beast has written, but because the left-wing media will continue lying claiming "he is far right-wing" the truth has to be shown. I feel you. I've been reluctant to post anything in the NZ threads because of the sheer ignorance of some of our readers and posters but the writing is clearly on the wall. The fact that the "far right" angle was even entertained is a stain on the ATS community. The fact this thread exists to try and blame the far left is a stain on ATS too. His manifesto included beliefs from different political idealogoes not just socialist, fascist and Conservative. You're doing the site as much of a disservice as those you decry. This guy didn't do what he did because he was a Right Wing Nut Job, this guy didn't so what he did because he's a Loony Liberal Lefty, he did this because of chemical imbalances in his brain. Like i asked many others before you two... Could you point out what "conservative views" does this murderer have? If you want ignorance denied then admit what these policies the nazis had were. They were not "right-wing." For crying out loud. Before the nazis abortion was banned in Germany and the nazis liberalized abortion as well. White women, and minorities could get abortion paid completely by the state if there was any possibility the child could be born with an illness, or genetic disorder. The extreme environmentalism of the nazis is very similar to the extreme environmentalism the left has embraced. Did people forget the video of UK kids that were interviewed and stated "I would die for the Earth" meanwhile these kids were grinning? Or the fact that those kids were used in a propaganda video in which the teacher asked who believed in Global Warming, and those that said "they didn't believe in it" their heads were exploded? Or even the calls by other crazy left-wingers that even called for stripping scientists of their degrees if they dared to doubt the AGW claim, or the calls even for imprisonment, or other attempts by the left to label as "science denialist" anyone who would dare doubt the false religion that is AGW? This needs to stop, otherwise soon enough the left and globalists will certainly do worse towards anyone who would dare doubt the fake religion of the 21st century. If showing the left how closely their views are to what the nazis believed, maybe at least some will wake up and stop pushing for the new "fascist" laws and policies the left and globalists are trying to push. How many of you in the left agreed with the writings in the Georgia guide stones before you learned they were set up and paid off by a nazi? edit on 25-3-2019 by ElectricUniverse because: correct comment. Wrong, first of all the thread is about the murderer, whom is not only a nazi but also showed other far left-wing ideology. If we were to talk for example about "Ferdinand Marcos," whom took his ideas from the nazis, we would have to point out step by step the policies implemented by Marcos... You, and the rest of the left, who are the true lunatics, can't even admit that the policies of the nazis were "left-wing..." So your attempt is to simply derail the thread. Instead point out how those policies mentioned here, which the nazis implemented, were "right-wing..."
Try to "enlighten us" as well on how the Chinese, which the murderer admitted to have social and political ideas more aligned to them, are "right-wingers..."
edit on 25-3-2019 by ElectricUniverse because: add and correct comment.